If your iBook G4 Charger Plug Cord breaks off or frays enough to quit working properly, all is not lost. You can fix it if you can solder wires back together. Here's how. You'll need to cut off the cord. First make sure you've unplugged the charger from the wall. Next you need to saw through the plastic barrel without damaging the circuit board or wires inside. I used a saw-blade steak knife. I small hack saw blade would work too. Cut back approximately 1/2 inch from the barrel light. As you saw, just go deep enough to cut through the thickness of the plastic as you rotate the barrel. Use short, light strokes. When you've rotated it 360 degrees, you're finished cutting. Slip the small end of the plastic barrel off of the rubber "plug" beneath. Now carefully cut through the rubber plug or sleeve with a small knife or scissors and discard it. The metal housing underneath appears to be a cord retainer originally designed to prevent pulling the wires loose from the circuit board in the plug. You should have at least 1/8th to 1/4 inch of useable wire to solder this back together. If you don't then you'll have to remove the old wires and solder new pigtails to the circuit board to continue. I've repaired two of these successfully without having to remove the old wires from the circuit board. Assuming you had at least 1/8th to 1/4 inch of wire left on the plug to solder to, prepare the wires for tinning with your soldering iron. Clean away any non-metallic cordage, trim the ends to 1/4", twist them tight and tin the ends with solder. Now prep the ends of the the wires coming from the charger. Strip back 1/2 inch of the the plastic insulation and carefully remove it without damaging the fragile wire mesh beneath. Then peel away this wire mesh surrounding the 1st, insulated wire and twist it together to form your 2nd wire. Make sure to remove the fiber cord when doing this. Clean and tin the ends with solder. Get some rubber insulating electrician's tape. Solder the gray, insulated wires back together. Cut some thin strips of this tape and insulate this soldered wire right up to the plug. Now solder the 2nd wires back together and using thin strips of the tape, insulate this wire from the first. Some people would skip this step as unnecessary, but you cannot be too careful to insulate one wire from the other. Now wrap the rubber tape around the end of the plug and back along the insulated, soldered wires. Some people would say to use shrink tubing or glue to protect the wires from breaking again. I have a simple solution, I think. It looks a bit weird, but works just fine. Start by folding the wire up alongside itself to where it lays alongside the plastic barrel. Tape it in place with a small strip of rubber tape. Don't go up too far alongside the barrel or the wire won't allow a flush fit of the plug into the laptop. 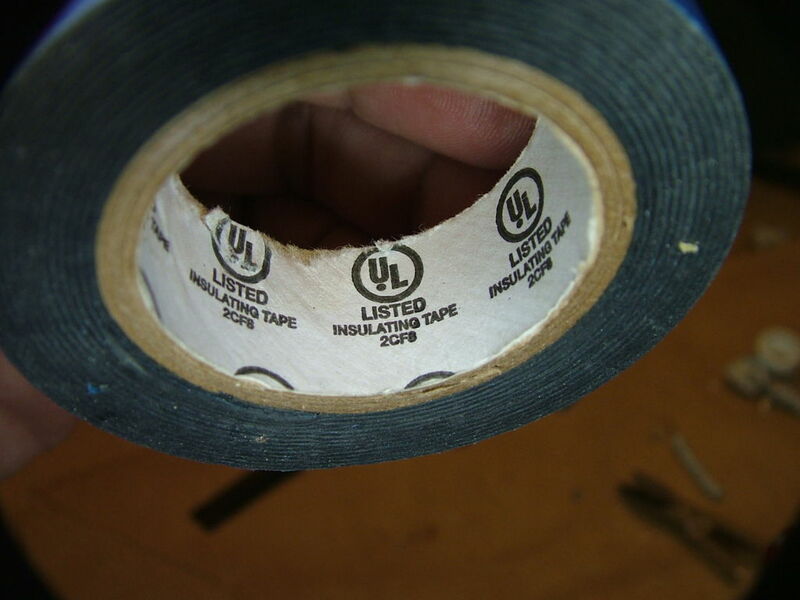 Once it is "just right," finish your rubber tape job. That's it! Your plug should work if you soldered things back together properly. You will now have created a side-load on the plug that won't bend and break the fragile wires. Some might think this will put more load on the fragile male fitting that slips into the socket on the laptop. If you prefer not to have this side load, just run the wire back along itself and tape over the second loop to where you have a plug with an end-load. Frankly, I think the side-load plug creates a tighter connection that is not as prone to wiggling around. For soldering, Radio Shack sells "liquid solder glue in a tube" that does the job, but has no real strength (which you shouldn't need with your new strain relief. Apply it with a pin or needle, not directly from the tube. Glue one lead, let it dry overnight, then do the other lead. All in all, it really looks like tacky engineering by Apple. Their strain relief design failed. And putting surface-mount circuitry INSIDE the plug itself is just unnecessary. Very good 'field engineering' instructable. Nice recovery from poor choices by the manufacturer. Thanks for the instructable. Even with the world's crudest soldering job, the cord works. Which is all I need. After all, the ugly soldering job is under the tape. I did learn that you have to be very careful to get all the stray strands of mesh away from the part of the gray wire that has been stripped. The mesh wires are very fine and almost invisible. . . but they still carry enough current to make a snap. I did this and it worked. Thanks. I used white electrical tape and it looks less Frankenstein. Yes, white tape would certainly look better. I just went with what I had in my electrical repair box. You're right about the Frankenstein look, though. Maybe you could send me a photo and I'll add it to the instructable with a credit to you for the good idea. Where did you buy the white tape? I've never soldered before, so I'm hesitant. Is it absolutely necessary to solder the connection or can the wires just be carefully and tightly twisted together and taped? You really need to solder it. Never fear, you can do it. You should be able to get a good 25 to 40 watt pencil soldering iron on Amazon or at Radio Shack for uor cnder $20. Solder for another $10 or less. It helps to have a set of those "helping hands" alligator clip holders to keep the wires steady. And you can learn absolutely anything reading instructables or watching a video on youtube. Nice instructable... I had the exact same problem.. I was able to pry the clear ring away from the white barrel, allowing me to re-solder the connections. I had to insert a razor blade and pry it out all the way around, it took awhile. After reinserting everything in the white barrel i filled the whole thing with clear epoxy. works and looks great, it actually glows in the back now where the cord goes in.